KALAMAZOO--A state survey with data that can enhance economic development and job creation in Michigan has been transferred to Western Michigan University, making Michigan one of just a few states in the nation to tap a research university to direct the role of mapping, evaluating and researching critical geological resources. 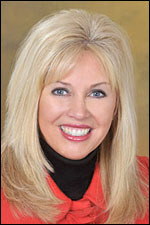 State legislation sponsored by Sen. Tonya Schuitmaker and signed Oct. 11 by Michigan Gov. Rick Snyder transfers the Michigan Geological Survey from the Michigan Department of Environmental Quality to WMU. It will become part of the University's acclaimed Department of Geosciences, which already is home to the Michigan Geological Repository for Research and Education. "This is a great example of government cooperation, and I want to thank university officials for working with the state to make this happen," Snyder said. "In addition to enhancing WMU's academic program, this change will also save taxpayers money. It's win-win." The move will make WMU Michigan's designated geoscience agency and put responsibility for mapping the state's geological resources--such as minerals, soils and groundwater--in the hands of a department that already is a storehouse of information concerning the state's groundwater and oil and gas resources. Michigan Senate Bill 507 transfers the survey from the Michigan Department of Environmental Quality to WMU. No funds accompany the survey, but WMU may be eligible for federal grants and awards to help fund that program and undertake research. 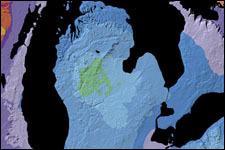 "What this means is that we will put our extensive research expertise behind the effort to effectively map Michigan geological resources and help the state use, manage and protect those resources in a way that will allow sustainable development and strong support for economic initiatives," says WMU President John M. Dunn. "We are grateful to Sen. Schuitmaker for introducing this bill and proud to have Gov. Snyder show his support and confidence in the caliber of the academic resources we bring to the project." According to Dr. Mohamed Sultan, chair of the WMU Department of Geosciences, budget constraints and staffing challenges when the survey was in DEQ hands meant the agency was only able to focus on regulatory demands. The state survey director approached WMU three years ago about the idea of the transfer so that Michigan could take advantage of the available resources, expertise, and technologies at WMU as well as pursue federal funding to improve the mapping and assessment functions of the survey. This would allow Michigan to catch up with neighboring states that have soared past Michigan in the use of such technology as 3-D subsurface mapping to facilitate industrial, residential and commercial development. The geosciences faculty unanimously supported the transfer of the mapping and assessment responsibilities of the survey to their department. "It is no secret that in the overwhelming majority of the 19 states in which the state survey is affiliated with a university, it is always the lead university in applied sciences that is selected to play this role," Sultan says. "To the best of our knowledge, Minnesota is the only other state in the nation in which a research university is actually in charge of directing the survey and its collection of subsurface data." Sultan notes that good mapping can show the distribution, size, location and quality of groundwater, oil and gas and other important minerals. It also reveals faults and danger zones that are important in making siting decisions. The absence of such comprehensive information about Michigan has caused the state to lose some industrial sites and has led to long-running disputes about use of water and minerals that could have been easily averted. "Studies have shown that for every dollar we spend on mapping, $30 worth of investments are realized by the citizens of the state. It is money well spent," Sultan says. "One of our main tasks will be the production of comprehensive and detailed maps for the entire state. Given the importance of this task, Dr. Alan Kehew, a professor of geosciences and an expert on glacial geology of Michigan, has been appointed as the director of the survey. He has been developing surface maps for Michigan for the past 16 years and is the person at WMU who will submit the required annual report to the state about survey activities. WMU's Michigan Geological Repository for Research and Education--MGRRE--is also a part of the geosciences department, hosts the largest collection of Michigan subsurface data and will play a critical role with the survey. The facility came into existence through the efforts of the faculty of geosciences and was championed for 30 years by Dr. William Harrison, professor emeritus of geosciences and curator and data manager for the repository. MGRRE has received strong support over the years from members of Michigan industry and governmental agencies, and those strong relationships will continue, according to Harrison. In addition to mapping, management and protection, another important role of the survey will be education. WMU will work through MGRRE to build awareness among citizens for the importance and value of geological assessment and evaluation. Sultan also notes that the presence of the survey on the WMU campus will build on the strong geosciences foundation already part of the campus and give faculty and students additional direct experience with resource assessment and management. "We will also bring all other relevant expertise in the College of Arts and Sciences and the College of Engineering and Applied Sciences to bear on this important project," he says. "The pool of experts on campus is large and we will tap into it. Our colleagues from geography, environmental studies, chemistry, biology, engineering and other units across campus are all eager to join this effort."